The tendency to use ﻿herbal ﻿products has been increasing nowadays due to concerns about synthetic substances that can easily cause irritation. The safe use of essential oils is widely considered as a less expensive and accessible way to promote physical, emotional and psychological health. In this article we talk about the properties of lemon essential oil, a fresh and uplifting fragrance known for its strong antiseptic and mood-enhancing properties. Learn about all the benefits of lemon essential oil for your mind, body and more! E﻿ssential oils are volatile liquid substances extracted from the plant material without the aid of chemical solvents. These oils are made up of a large array of chemical components, giving each oil its particular fragrance and therapeutic characteristics. Lemon essential oil (Citrus limon) is obtained by expression method, without application of heat, from the fresh lemon peels. Its main chemical components are D-limonene, β-pinene and γ-terpinene and published studies regarding its benefits generally focus on aromatherapy use and its psychological effects, but the topic use of lemon essential oil is also considered by many people as a complementary treatment for skin-related conditions. It can also be used to nourish leather and prevent it from splitting, wooden furniture polish, or to restore shine to metal surfaces. Anxiety reduction: Lemon essential oil has the ability to lessen stress and anxiety, which has been proved using animal models. A study has shown that exposure to lemon oil odor decreases plasma levels of corticosterone (which is released as a stress response). Another study also indicates that lemon oil vapors possesses anxiolytic ﻿and antidepressant﻿﻿﻿﻿-like effects. Positive effects on mood: Lemon oil is commonly known for having an uplifting and mood-enhancing action. Research found clear and consistent evidence that lemon oil inhalation enhances positive mood, boosts norepinephrine release, and is associated with increased heart-rate and enhanced mental and physical task performance. Improve cognitive function: Research shows that lemon aroma can have a positive effect on attention level and concentration, perception, cognitive performance, memory, and mood during the learning process. Aromatherapy is frequently used in Japan to increase labor efficiency, and it has been found that worker errors decrease by 54% when a lemon fragrance is used in the workplace. Another study determined that the lemon aroma sprayed into a classroom increases attention level, enhances cognitive success, and memory of students. These findings suggest that lemon essential oil might have a positive effect on attention level, alertness and cognitive performance. Relieve nausea and vomiting: A study has evaluated the effect on lemon oil inhalation aromatherapy on nausea during pregnancy. Two groups of participants were asked to follow the nutritional recommendations and lifestyle changes, and when they felt nauseated, they had to drop two drops of the solution on a cotton, and keep it in distance of 3 cm of their nose, breathing three times deeply. Of the 100 women that participated in the study, an average of 33% decrease in nausea and vomiting was observed in the essential oil group compared to placebo. 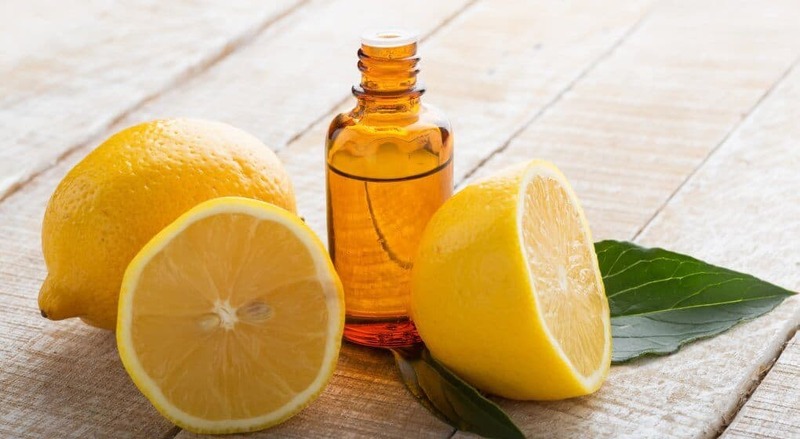 This study considered moderate use of lemon oil in aromatherapy to be safe during pregnancy, suggesting that it can be considered as a non-pharmacological alternative in the management of these symptoms. The antibacterial, antioxidant and anti-inflammatory potential of lemon essential oil has been reported in many studies. Additionally, limonene, the main compound of lemon essential oil, has demonstrated significant anti-inflammatory and wound healing effects on the epidermal barrier in Murine models. Emerging evidence shows that plant-derived essential oils and their major compounds may represent a plausible alternative for skin problems such as acne. Additionally, many over-the-counter topic therapies for acne have certain drawbacks – they can cause allergies and skin irritation, leading to lack of adherence and increasing the need for alternative products. When combined when other natural ingredients, like sugar, it can act as a natural exfoliating body scrub. Mechanical scrubs cause desquamation of the stratum corneum, the outer layer of the epidermis consisted by dead cells, leading to younger and smoothing-appearing skin. The mild abrasion that occurs unroofs closed comedones and prevent their progression. Lemon’s oil antibacterial properties can help fighting off bacteria and plaque in the mouth. A study compared the antibacterial efficacy of lemon essential oil in comparison to antiseptics against oral microorganisms and showed that it has better antimicrobial properties than standard oral antiseptics, and its use in clinical and oral hygiene applications might be considered as a natural alternative at a reduced cost. Lemon essential oil also ﻿﻿inhibits ﻿﻿growth and adherence of S. mutans, the primary oral cariogenic bacteria. Lemon essential oil is phototoxic and can increase skin’s sensitivity to direct sunlight. If you apply it on the skin, avoid sun exposure or UV radiation on skin for at least 72h where it has been applied. Essential oils ﻿don﻿’t need to be approved by the FDA and its internal use is not recommended. Due to the lack of clear information regarding the toxicity of essential oils during pregnancy, do not use if you are nursing or in children less than 12 years old, since essential oils contain organic compounds which may be toxic or cause severe irritation to infants and children. ​Essential oils are highly flammable substances and should be kept away from direct contact with flames, such as candles, fire, matches, cigarettes, and gas cookers. You can read further information about the safety of essential oils and possible dermal reactions in the National Association for Holistic Aromatherapy safety page. I hope this article has been helpful for you. If you have your own tips on the use of lemon essential oil or if you have any questions or comments, let us know in the comment section below. Ana Valério is a Doctor of Pharmacy currently working in Medical Writing and Healthcare Communications.